Have you ever wondered how corporations communicate with journalists? How do big organizations present what they say and subsequently what do journalists report about them? And how does that effect the public? Read on to find the answers! In his recent publication “The co-production of business news and its effects: The corporate framing mediated-moderation model” Piet Verhoeven (2016) sheds more light on the interdependence between PR, the organizational logic and media logic. Corporations serve as an important news source for journalists. Media relations have long been considered a key facet of public relations (PR). This study presents scientific literature on businesses and news media published between 1963 and 2013 and models what corporations say to journalists, how they present what they say, the relationship between PR professionals and journalists and what journalists report about corporations and consequent effects on the public. A total of 217 empirical studies are categorized and synthesized into a corporate framing mediated-moderation model, which considers both the mediating factor of relationships between PR professionals and journalists and the moderating factors of culture, the sector and the PR profession. All publications were found in ISI-ranked and English language peer-reviewed journals in the fields of organizational communication, public relations and corporate communication. Six ISI-ranked journals and five peer-reviewed journals were manually searched for papers on businesses/corporations and the news media. A simple structural model was used to group the studies in four groups – who says what, in which channel, to whom, with what effect. The examined interdependences are explained through the corporate framing mediated-moderation model (CFMM). It describes the co-production of business news between PR professionals as representatives of corporations and journalists and its effects on publics. Corporate, media and public frames are central to the model. 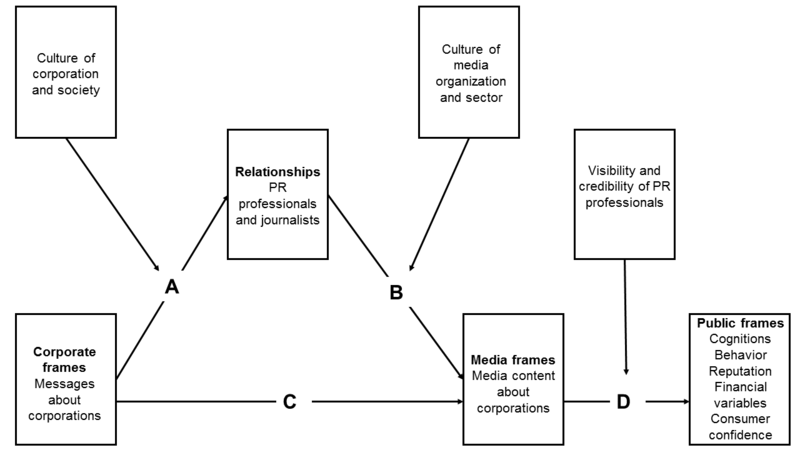 The relationship between corporate and media frames is mediated by the relationship between PR professionals and journalists. The relationship between PR professionals and journalists and the corporate and media frames is, in its turn moderated by the cultures of the corporations and media organizations involved, by the given sector and by the culture of the society involved. For more information check out the article in Public Relations Review and get acquainted with the details of the research. For further information you may contact the corresponding author at P.Verhoeven@uva.nl.